Reading in kindergarten is fun, especially when the passage is about doing things together as a family. Bubble in the answers. It's both a mystery and a surprise. What was in the box? Probably not what you think. Please enjoy this passage for kindergarten kids! 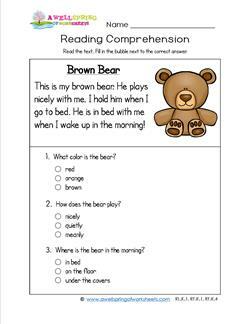 This reading passage for kindergarten tells of a snuggly bear at bedtime. 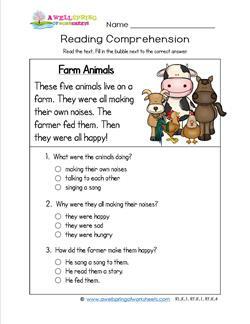 Kids read the passage and bubble in the three answers. 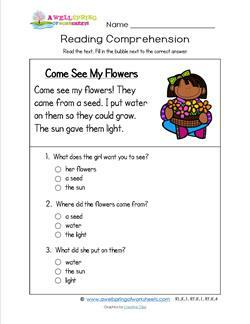 This reading passage is perfect for a science lesson about plants. You need a seed, water, and the sun! This kindergarten reading passage is similar to the story of The Three Bears. In the end the child is the big winner here! Pumpkins are all the rage in fall. 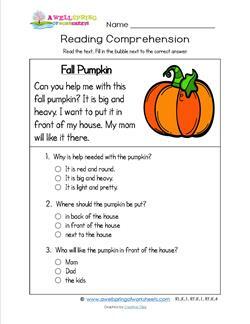 In this reading passage a child wants to move a pumpkin, but it's too heavy. These farm animals were in quite a plight. 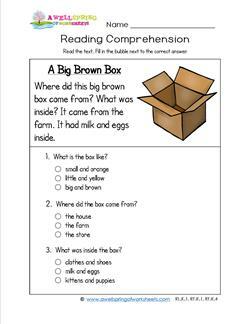 Read the passage to find out what the problem was and how it was solved. This reading passage for kindergarten is a riddle. 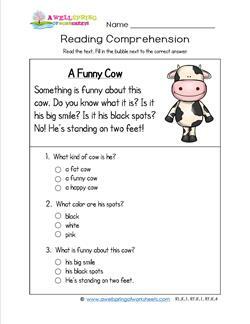 What is funny about this cow? Can you figure it out? Who will figure it out first? So here is a life lesson. If you are planning to go somewhere cold, bring a warm jacket! 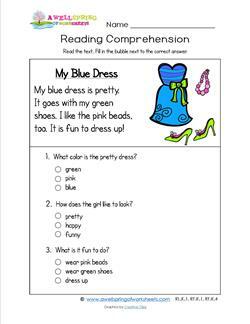 Kids read the passage and answer questions. 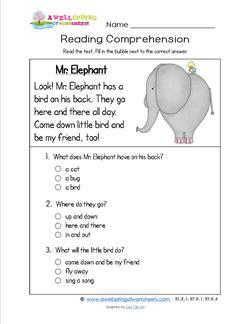 Well, take a look at the cutie in this reading passage for kindergarten! 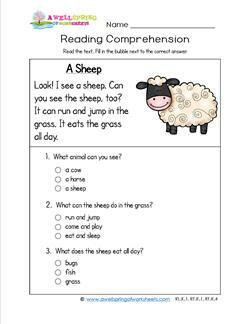 Kids read about the sheep and answer 3 questions. This reading passage for kindergarten is about two buddies that travel together. 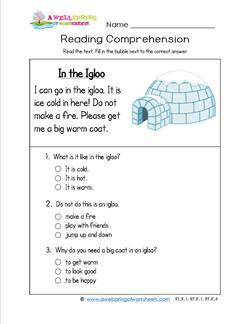 Read the passage and bubble in the answers. Forget a little black dress. Every girl's got to have a blue dress as pretty as this one! Don't forget about the accessories! It's great to have friends, even ones that are green and hairy! 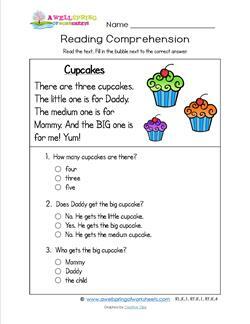 Enjoy this funny reading passage for kindergarten! 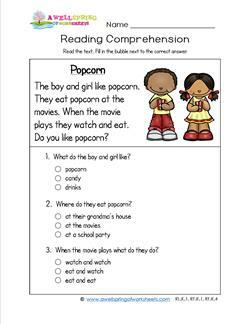 This reading passage for kindergarten has a brother and sister who are fans of popcorn ... and the movies! Are you? 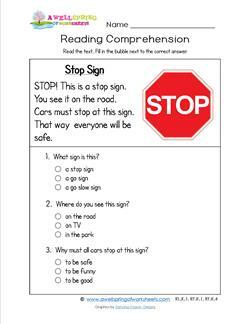 We get a little serious in this kindergarten reading passage and talk about the rules of the road. Stop when you see a stop sign! 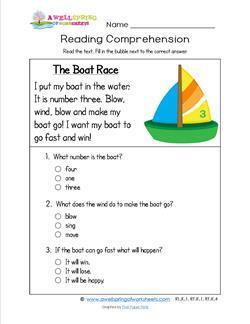 The boat in this kindergarten reading passage wants to win the race! Come on little boat. You can do it. I know you can. 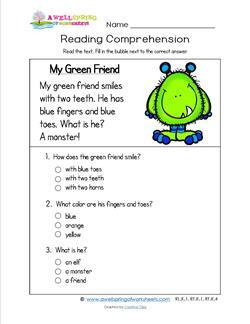 I bet you've never seen a reading passage for kindergarten about your own feet. Well, now you have! What can you do with them? 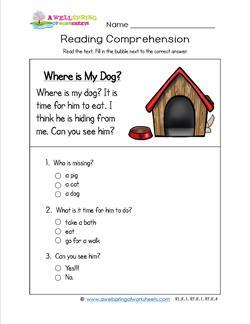 This reading worksheet for kindergarten is kinda cute. Where did the dog go? It's not too hard to find him! He's a funny dog.